﻿ HuntingNut » Forums » Firearms, Shooting & Reloading » Gun & Firearm Discussions » Synthetic to Wood? Posted: Sat Mar 22, 2008 6:14 am Post subject: Re: Synthetic to Wood? I hope you understand that $500 is no real money to pay for a stock blank. I am going to show you one of my stock blanks. 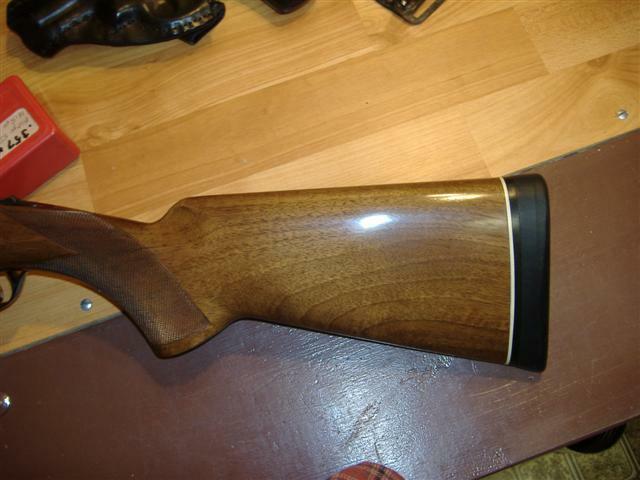 Cole Gunsmithing, the Beretta custom house, gets $2,500 for such a stock. 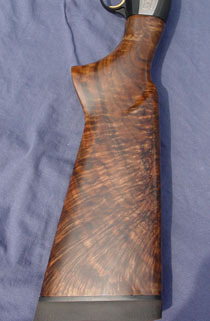 The pictured exhibition grade stock is Claro Walnut with 100% figure left and right and the rarest of patterns, feather crotch. I own a wholesale stock blank company specalizing in AAA and better grade blanks. You either appreciate fine wood and fit or you do not. Posted: Sat Mar 22, 2008 6:26 am Post subject: Re: Synthetic to Wood? A rather small photo there Swampy...You wouldn't, by chance, have a magnifying glass I could borrow would you? Posted: Sat Mar 22, 2008 6:37 am Post subject: Re: Synthetic to Wood? that way when something happens i dont feel bad for dropping it. Posted: Sat Mar 22, 2008 8:42 pm Post subject: Re: Synthetic to Wood? Hey Swampy....do you take your top grade wood into the field or are they only "range" rifles? I reckon there is nothing better looking than a really nice piece of well grained wood....doesn't matter what the species of tree its from....if it has nice grain, then it is good looking. My knife carries a handle that I handcarved out of a native Australian tree we call Turpentine. The wood has a nice rich red colour to it and there is a fair bit of sap throughout it. After a few coats of linseed oil it has darkened up a bit and looks (to me) great. I have often thought about getting a nice piece of timber and making a stock for my Weatherby, but like Morax says.... if its ugly and works i keep it around...that way when something happens i dont feel bad for dropping it. I can't argue with those sentiments, although I can think of couple of instances where ....nah, lets not go there. Posted: Sat Mar 22, 2008 8:47 pm Post subject: Re: Synthetic to Wood? Posted: Sat Mar 22, 2008 8:51 pm Post subject: Re: Synthetic to Wood? I don't mind having my guns or anything for that matter get dinged/worn/abused cause well it only shows that they are being used and not kept "clean". Kinda like if someone was into Cowboy action shooting and had custom expensive holsters, and after each match went to the bench and polished out all of the marks it got while being used then wrapped them in fine packing paper to protect them at the end of the day. I just don't see the need for that, if they are getting used and abused, well whats a matter it in showing that ?? Posted: Sun Mar 23, 2008 7:13 am Post subject: Re: Synthetic to Wood? Vince, I have a blank that comes from the Pacific islands. It is called by various names, Rain Tree or Monkey Pod are pretty much standard names for the wood. It is rare that a tree gets to stock demensions, so I keep a blank in invetory. Misquite is another wood that is mostly from small trees and a good blank is fairly scarce. I made a rifle with a exhibition Misquite stock for my father. Yes, I use my guns to hunt and carry them to far off places like S Africa or Argentina. The Beretta 391 just like you see it, is my quail and dove gun. It has traveled to the local fields and to S Dakota and Argentina. D, you mention Cowboy, I have a shooting buddy and friend that only uses original Colts and Winchesters. He bought an unfired consecutive numbered pair of Colts for his two gun rig. He shoots the guns about every week and does not care if they get dinged. He owns about a half dozen Kreigoff guns as well, including a Plantation model, which is a cool 30k. You guys assume way to much. If a person can afford the guns or the wood it is not necessary that the buyer consider them any more than you might consider a Raven or RG. If you love guns, if you have the money to afford a fine gun, say you are a multi million aire, would you buy a stock 1100 Remington? 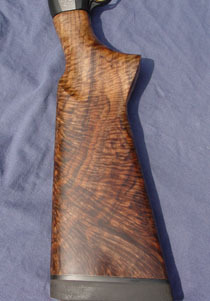 A fine piece of wood on a fine gun, in the field or at the range says a lot about the individual. Bushy, just for you, a larger photo, can not have you strain your eyes. Posted: Sun Mar 23, 2008 7:15 am Post subject: Re: Synthetic to Wood? Posted: Sun Mar 23, 2008 7:17 am Post subject: Re: Synthetic to Wood? This is my Africa hunting rifle, the 458 Lott with an exhibition Bastogne Walnut stock. He owns about a half dozen Kreigoff guns as well, including a Plantation model, which is a cool 30k. Thats more money the I could ever spend on a single gun. If you love guns, if you have the money to afford a fine gun, say you are a multi million aire, would you buy a stock 1100 Remington? I must admit, I would still buy "cheaper" guns, as I could buy more of them. could buy 6 "expensive" hand guns for that 30K. Posted: Sun Mar 23, 2008 8:04 am Post subject: Re: Synthetic to Wood? a fine piece of wood on a fine firearm in the field tells me the guy 1 either got too much money he knows what to do with, or he is a buyer of skills ..
there is another board that i am a member of and the monicer is "the proof is in the pile" as in it dont matter at the end of the day the one with the gutpile wins.... like i said yes those are beautiful firearms, would i own one if i could, nope, but thats just me, you on the other hand be my guest, and share the pictures!!! Posted: Sun Mar 23, 2008 8:05 am Post subject: Re: Synthetic to Wood? I've always known it as "Monkey Pod"...Have you ever worked with Myrtlewood from the Oregon? Posted: Sun Mar 23, 2008 12:26 pm Post subject: Re: Synthetic to Wood? Nope, I have not gotten up the starch to start a myrtle stock yet. I was going to do the misquite and then the myrtle. This is a myrtle blank I have in inventory. It is iradescent just as it looks and will make a dazzling stock. That is a good piece of American Black. I furnished an exhibition grade stock in American Black to a stock maker that was building a rifle for a guy who owns 6 reastaurants in Florida. He is a self made man, as a kid he always wanted a Marlin 39A. So he bought a dog, had it totally refinished and engraved end to end and a feather crotch piece of wood put on it. He wanted his child hood dream and had it built. The blank alone was $475. American is difficult to find in a high grade figure. 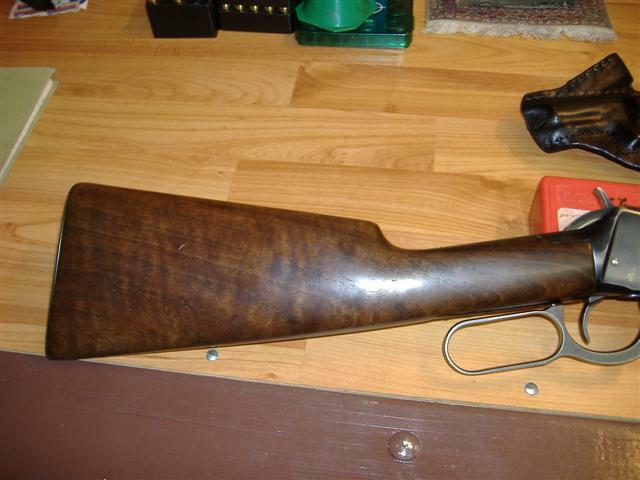 The old Winchester Delux guns had good figure but few had real high grade wood. I furnish wood for one of the premier Win and LC Smith restoration houses. Most of the wood they want is A or AA wood. Posted: Sun Mar 23, 2008 12:28 pm Post subject: Re: Synthetic to Wood? This is the monkey pod blank I have in inventory, when cut it throws sparks from the minerals within the wood, very dense and heavy wood. Posted: Sun Mar 23, 2008 1:24 pm Post subject: Re: Synthetic to Wood?